Dart. – Dirty wet dog , boats and sailing. Several years ago i bought a very cheap ‘classic’ wooden boat on ebay (Deben 4 tonner) with hardly anything in the way of gear and made it my summer project to sail her from Chichester harbour back to my then base in Torpoint. In the final stages i got round the Bill of Portland and sailed the long stage across Lyme bay but went straight for Dartmouth rather than attempting the Exe entrance without charts or a decent engine. At that time it was the first and only time i had ever put into the Dart : from memory i found a trot mooring right at the entrance and got my head down immediately after some 22 hours on the water. After just a few hours sleep the Deben rolled me out of my bunk having taken up s sickening cyclical roll so i high-tailed it out of there. The Deben project came to a rapid end when i realised just how much i disliked the boat and instead i concentrated on saving up enough cash for the boat i really wanted : the Frances 26. 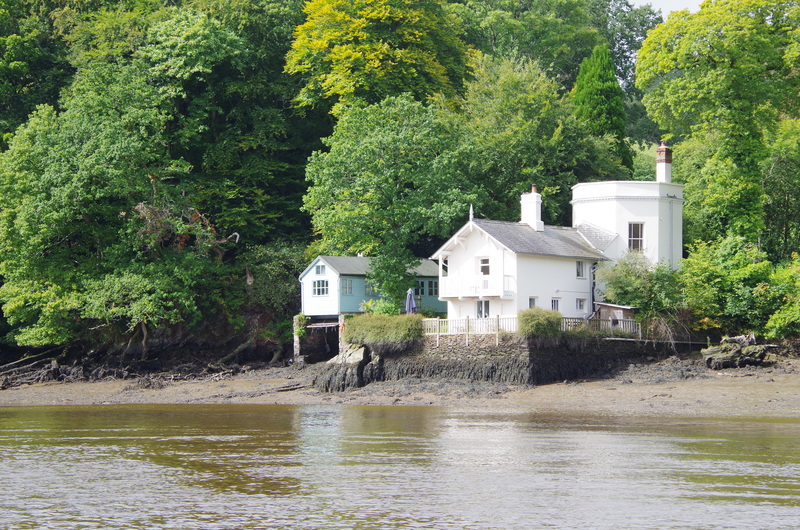 Aside from that the only times i have been in the river were to go and see Pete Goss’s cat being built up at baltic wharf and to run some canoe training in the river off the Sharpham estate…the very cute house is i think part of the estate. Its a shame today that i can’t find any pictures of my own of the Goss boat so i have borrowed one (as usual !) I remember the day that i went to see the big catamaran being fitted out : at that stage she had been painted but was still inside the shed having all the gubbins fitted. I remember walking underneath the boat and having 2 reactions simultaneously : first was that it looked less like a boat and more like something from star-trek and secondly that “this thing is going to break” ! Credit : Gordon Thomas photograph. Most of the time we were in the Dart it looked like this : grey and drizzle with short periods of sunshine which was when i did most of the filming. To access the town the harbourmaster said to use this little pontoon which belongs to the yacht club . I think this boat below is one of the boats that i was considering when i was searching for a bigger boat : its an evolution 26 with a lifting keel, a quick boat by all accounts. The big hatch/cockpit cover caught my eye on this one as i couldn’t decide if it makes the boat a better cruising boat or a worse one. I really can see the advantage of having a soft cuddy almost but i’m not sure i would want the extra windage on a small boat. With the town of Dartmouth on one side and Kingswear the other there are moorings and marinas everywhere so plenty to look at but there is lots more of the river inland and plenty of places to go hide and anchor, which is exactly what we did. For reference ,although the young harbour master came up to collect harbour dues he was also very helpful in pointing out the good anchoring spots . For the first night we anchored just downstream of anchor rock and then moved up to an even better spot just inside Bow creek for the second night. The river itself is navigable at least in WABI”’ all the way up to Totnes so we poked right up there as well later in the trip and did a bit of filming coming down the river. As rivers go i don’t know the sea-end well but know the middle tidal section from having canoed on it and even better as one of the moorland rivers having swum in the Dart many times out on the moor. Anchored just inside Bow Creek with a full moon just rising. This was a good anchoring spot for us as the creek has good holding on thick mud and shelter from the then brisk westerly and north-westerly breeze : its also well out of the way of the ferry and tour boats up to Totnes. Motoring downriver just past Ashprington point in better weather on day 3 in the river. A lot of the time there it was too wet to have my main camera on deck so mainly what i did was film just short clips with the little video camera. My short film at the end here is mainly all shot from leaving Baltic wharf at Totnes and motoring down the river right to the Dart entrance. The countryside really is nice as soon as you leave Totnes and its great to see the bends of the river gradually open out. Totnes is somewhere that i really don’t like : the Dartmouth harbour guide describes it as “varied and diverse” : my take on that is that it is full of hippy-dippy wannabee dropouts and their glue-sniffing teenage children. Ok so there are some useful shops but equally there are the ‘alternative’ ones that wear their alternativeness like a dank and scruffy uniform and i can’t say i was impressed by the chic looking cafe that we used : cool latte and yesterdays donut. Putting that aside though i have enjoyed a lot of my time around the Dart , this is one spot that i used to go to myself and is shown well in this short filmof wildswimming in the Dart at Sharrah pool. If you can find it try and see the whole Alice Roberts film about wildswimming based on the Roger Deakin book ‘Waterlog’ and definitely read the book. Its the Dart and parts of the Plym that i most associate with my own wildswimming : for one whole year i tried to swim in a small pool in the Plym at least once a week and that was right through the year. The Alice Roberts film is a delight as she goes looking for many of the places that Roger Deakin describes in Waterlog. If i could recommend one ‘must-read’ for anyone who likes water then that one book would be Waterlog. Although my blog here is mainly about boats and sailing it is also partially about the experiences of being on , in and under water having been a sailor and kayaker/canoeist and swimmer/diver too. Boats if you will are just one part of a greater (and simpler) outdoor life that takes in simply messing about in water at one end and crossing oceans at the other. Sometimes i think that big boats are just a distraction , i for one have had far more enjoyment with my Liberty than i ever had with larger and deeper keeled yachts. I still enjoy canoes….i really should get around to building a plywood one here and doing more filming of the upper reaches of rivers. Steve, the Totnes to Dartmouth Youtube link is broken. Looked to be a nice trip despite the weather. I have re-posted the link so it should be working now. We had to abandon the trip at the end as the weather gradually got worse.